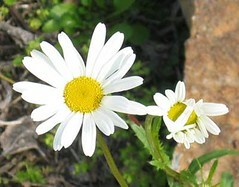 This shasta daisy is from my mother from her new house. I have one other plant from her, a canna. She got the canna from a neighbor when they lived on Michigan Avenue in Oakland. So it’s been in the family about 15 years longer than I have. Mom kept it in a pot on the deck at our house in Piedmont. By the time I got it, it had filled the pot with tubers. I had a terrible time getting it out and divided. Perhaps, some day, I will pass these 2 plants on to my children. On the sewing front, I altered 2 t-shirts yesterday. They’ve never fit well. RTW doesn’t do darts in t-shirts, so to get them big enough for the gigantic ones, they are too big in the neck. Losing weight made them even bigger. All I did was take the backs in. I think they will work. I’ll have to wear them and see. I’m not sure what I’m going to start on next. Maybe jeans? I’ve gone down a size, so my wardrobe just expanded to my prepregnancy clothes. And that includes a lot of pants which were in short supply in my wardrobe. Buttina is now too big. Her high bust is more than 2 inches bigger than mine. I’m still wearing most of the clothes that I made when heavier, but they are getting big. I have no more TNT patterns!